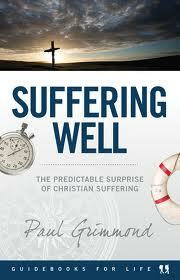 The title seems almost an oxymoron as suffering “well” strikes most of us as an unreal concept. On the other hand, if our Lord made it such a key component of our lives, it simply must be a good thing. So to read something along the lines of this book by Mr. Grimmond and published by Matthias Media should be on our agenda on occasion. We simply must get some sort of handle on something that is going to define our lives on some level. This volume sheds light, light we really need. This book comes from a different angle than many I’ve seen. One clue is in the sub-title: “The predictable surprise of Christian suffering.” It is part of Christian experience. While he discusses personal or general suffering, the focus of the book is clearly on suffering as a Christian. There are many fine books on general suffering (for example, the writings of Joni Erickson Tada),but far fewer on suffering because you are a Christian. Mr. Grimmond does well in tying suffering to the larger picture in the chapter on “But why?” I appreciated this comment on the Lord: “God is not an evil young boy pulling the wings off flies. He did not make the world so he could revel in sadistic pleasure. But in some profound way (and here there are many mysteries), suffering is at the very heart of God’s plan to create a perfect world and to glorify himself through his Son.” Well said, don’t you think? As the book proceeds he draws out clearly from Scripture that “all Christians, without exception, must suffer.” He explains how the New Testament so changes the emphasis and that we should note it. Job and others discuss the suffering in life while Jesus and Paul focused on suffering as a Christian. I believe that both are needed for a balanced Christian perspective. He explains that persecution is more than dying at the stake. In our culture it’s the many compromises that come in family or work that risk real persecution. An awareness is key here that this too is what the Bible is talking about. Take note of his explaining the value of Hebrews 12 on this subject. He further explains that our goal is to be godly in the suffering the Lord allows into out lives. Then there is the value of God being so real at these times. Yes, these book has real value. How’s this for a timely subject? Not only is the world writing off church, but more and more professing Christians are. This book by Mr. Crotts and published by Shepherd Press enters the fray to stop the bleeding. Christians ought to face his arguments head on. There is simply no doubt that the Lord meant for the local church to be part of every Christian’s life. Mr. Crotts writes with a pastor’s sensitivity and persuasion. Having pastored since 1995, he likely has had plenty of time to consider these things. He wisely divides his manuscript into two halves: 1) What is God’s family?, and 2) How you fit into God’s family. He uses a story of a group of people with varying attitudes about the church gathering at a coffee shop to discuss the topic. That’s a somewhat novel approach that some will like and some will not. Even if you don’t like it, it really doesn’t distract from the more theological discussion. He hits upon the idea that deep down we all know we should go to church. I couldn’t agree more! He admits that many churches have given people a “bad church” experience and churches have such a variety of ways to fail. Whether it be theologically or either extreme of entertainment centered to reach people or extremely harsh on the other hand, there are many options. In some churches the people are off while in others the pastor might be. In a few, they might both be. In other words, church bashing is an easy sport to play. From there Mr. Crotts lays out the Scriptural case for church. I agreed with his analysis on most every point. He even touches hot-button issues like church discipline, but writes with restraint and care. He concludes with a plea for us to make church a priority in our lives and families. All in all, a worthy contribution. They made a mark. No trio of names among Independent Baptists could possibly have more admirers. This question about them is worthy of examination: why did they become so well known? The usual answers– books and newspapers, large churches, large meetings, large colleges, and large numbers of professions of faith– are not, in my opinion, what really took them from among the ranks of preachers and lifted them up. You would have to go back to when they were younger men. You would have to back to before they were Independent Baptists to when they were part of the Southern Baptist Convention. A battle raged in those days as many felt that liberalism of the worst sort (full-blown unbelief in Scripture) was creeping in. Many like these men started standing against it. As can happen within any denominational setting, pressure was brought to bear to not buck the denominational leadership. These three men were particularly charming, dynamic, and natural leaders. I’ll leave their legacy for someone else to figure out, but even their worst enemies could not deny this fact. So more than usual pressure was applied because of the influence they clearly had from their youngest days. Many around them in those days could not help but admire them paying the price. And pay it they did. If you listened or read them enough, you realize they were threatened to the point they were told they would never find another Baptist church to preach in. You know they were nervous about it. You know it because you can never know how such things will turn out. The cost of going independent was real and great. Still, they did it. Whatever you would want to say about these three men, only following what they believed to be true could explain the decision they made. No pressure from others could cause them to violate their consciences on matters they felt important before the Lord. People saw this for what it was and they each had a following the rest of their days. 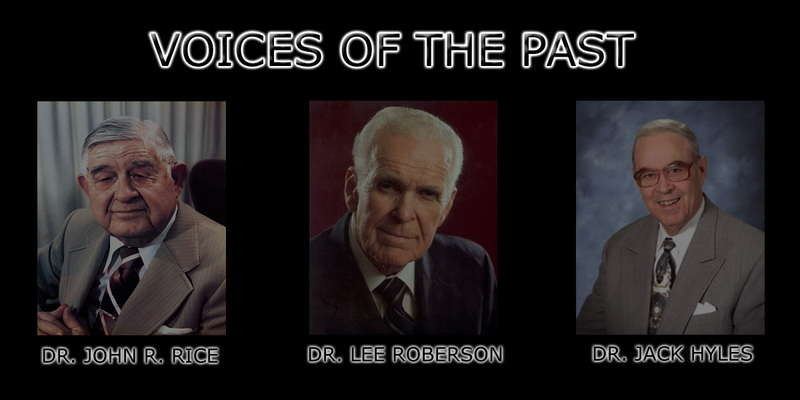 After those pivotal days they each had a ministry that lasted many years and influenced many preachers and families. As with anyone else in ministry they made decisions about every detail of life and ministry. We can’t criticize that as every single one of us do the exact same thing. They were never afraid to let others know what they thought as you might expect from such strong personalities. Now fast forward to the latter years of their ministries and even now after they are gone. The throngs of people who count them as spiritual fathers number in the thousands. These followers understand that these men possessed something of greatness (as men go) and see themselves as following in their footsteps. My question is simple: Do they really follow these three men? Do they really follow in the one vital element that made them great? The greatness that said no man or group will dictate to our consciences? It seems that many of their followers today do not follow them in the defining step of their lives. Not only do they not follow, but also they fully reject and ask of others the very things that Rice, Hyles, and Roberson were asked years ago. You know…follow us or pay the consequences. Don’t rock the boat. Do exactly what we do simply because it is what we do. Years ago these three were told to be good Southern Baptists and today how many times within the Independent Baptist world is the argument little more than that you had better make sure you are a good Independent Baptist? I hope you see that my point is in no way Southern Baptists versus Independent Baptists, but rather soul liberty versus denominationalism. Despite all the wonderful Independent Baptists I know and I admire for their love of Jesus Christ, and despite the fact that I am personally an Independent Baptist myself; we must admit that denominationalism now runs amok. Allegiance to our group is now the separating point rather than the Person of Jesus Christ or even the more well-known tenants of Baptist thought. The minutest detail about how a church service looks or the precise details of what we wear or watch or listen to, are in play to turn away from someone. In other words, soul liberty has been sacrificed upon the altar of the acceptance of men. I’ll tell you what it is. It’s a wasting of a legacy. It’s a repudiation of the historic Baptist position. It’s a direct assault upon our consciences. And worst of all, it’s disloyalty to Jesus Christ. Do you see their shadow? If you listen carefully do you hear their ghosts passing through the Independent Baptist world? I suggest you look and listen more carefully and not miss the best lesson they ever taught us. In 11 chapters, he traces miracles from creation on through to the Resurrection and then Paul’s conversion. If you are well versed in the Bible these chapters will be a review, though a well-worded review. For a newer Christian, these chapters would be a real boon to understanding. 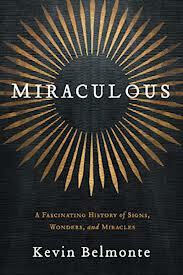 In Part 2 (chapters 12-29) Mr. Belmonte traces miracles in the lives of Christians in the post-biblical era. These make great reading–think challenging biography–that prove his thesis. Miracles aren’t for show, they aren’t to be manipulated, but they are real, and they are of God. The first one was new to me. I was not aware of Perpetua, but was so moved by her story. The miracles he writes of were profound and surrounding the events of her martyrdom. Don’t think her death nullified the miracles. They did not. Many other’s stories are told. Even George Washington gets a chapter, a really good one. You will enjoy these stories. Perhaps you will wonder why some favorite character of yours didn’t get a chapter, or you might disagree with one he chose. He never, though, promised us a comprehensive volume. Also, the fact that so many chapters could have been substituted only proves his premise–miracles are a big part of God’s dealings with us. He tells the story well and without wild excesses. I recommend it. Welcome to Kyle Shearin’s class at the Crown College. Glad to have this opportunity to share this with you. The Gospel of Matthew holds a special place among the books that make up the Word of God. We must carefully analyze the features of Matthew to determine what our Lord intended us to have in giving it to us. Traditionally, the theme of Matthew has always been described as Jesus is the King of the Jews. Without doubt, there is much about Jesus as a King with His Kingdom in this Gospel. Israel is especially in view and the Jewish people are clearly the original intended audience. However, does that really express fully the purpose of our Lord giving us the Gospel of Matthew? We believe the idea that Jesus being the King of the Jews starts us down the path to an understanding of Matthew’s Gospel, but does not alone capture the essence of what we are to see here. The purpose for this Gospel is not so much that Jesus is the King of the Jews, but rather coming to terms with who Jesus the King of the Jews really is. As we consider Matthew, how do we get to the theme? We find that various strands of thought are woven together with divine hands. If we think about Matthew, what are the key elements that we find? With the Jewish emphasis of Matthew’s Gospel, surely the thought of Jesus Christ fulfilling all that the Old Testament said about the Messiah is one. As we progress reading, we see that Jesus Christ shows Himself mighty as He performs miracles of the greatest magnitude. As stated before, there is much about the Kingdom and we find that Jesus Christ the King explains, and in a way never seen before, governs His Kingdom. What also becomes progressively clear as one proceeds through Matthew is that Jesus Christ faces rejection. That rejection comes amid the irony of the great evidence of Who He is. These strands of thought taken together bring the theme of Matthew clearly before us. The theme of the Book of Matthew, then, is that Jesus Christ the King of Israel is the Son of God. With this theme in mind, we can see how carefully it is carried through the Book of Matthew. Jewish people had their ideas of what a king and his kingdom should be and this had to be shown, particularly to Jewish readers. This kingdom is not made up of political elements as much as spiritual ones. Why would this need such careful explanation? The Jewish people, Matthew’s original audience, knew their Messiah would be a powerful and mighty king, but they were not seeing that He was the very Son of God. He is the fulfillment of Old Testament prophecy, but the Old Testament only touched the hem of the garment. King Jesus, the long-awaited Messiah, is the Son of God. In developing the case that the theme of Matthew is that Jesus the Messiah was the Son of God, we notice many trends contained in the pages of Matthew. Take the title “Son of God”, which is mentioned 8 times in Matthew, and notice its usages. The first three mentions of the title are spoken by either Satan or a demon. Matthew even highlights the irony of the depths of the rejection Christ faced by showing that the Devil and his henchmen admit what those in Israel could not. The double irony also developed is that this rejection in no way overthrew or even hindered what King Jesus planned for His Kingdom. Particularly in 8:29, the demons, in a state of abject fear, tell what they know to be fact when they call our Lord “Jesus, thou Son of God.” What better evidence could there be than this confession? In the Gospel of Matthew the Jewish reader, as well as all other readers, must grapple with the fact that Jesus, though not the king Israel wanted, is the King Who is the Son of God. Another usage of the title “Son of God” appears in Matthew 14:33. There in one of the greatest physical miracles that Jesus performed in His earthly ministry He rescued His terrified Disciples in a ferocious storm on the Sea of Galilee. Matthew gives the most detail on this great miracle. Only he records Peter walking on the water to Christ, growing afraid and sinking, and then being grabbed by Christ before going under. When Jesus stepped into the boat, the winds ceased. This miracle was so awe-inspiring that the Disciples with worshipful hearts proclaimed: “Of a truth thou art the Son of God.” For the record, Matthew was one of those Disciples. Jesus Christ is clearly more than an earthly king, more even than a king with God on His side. He is the Son of God. The next three usages of the title “Son of God” come from His enemies. Each case is one of mocking sarcasm. The High Priest at His sham of a trial, the crowd of human vultures around His cross, and finally the chief priests, scribes and elders at His cross ridicule Him in His sufferings. The irony the reader of Matthew sees is all that the first 25 chapters told us of Him. His reception does not match the facts of His Person. He is the Son of God. The final usage of “Son of God” in Matthew is the most ironic of all. Jesus has just died on the cross. Matthew records the statement of a Roman centurion: “Truly this was the Son of God” (27:54). With his rank in the Roman army, this was not the first crucifixion he had witnessed. Likely, he had grown accustomed to the grisly scene of death. This story happens against the backdrop of Israel’s rejection. This soldier’s allegiance is to a king in far-away Rome while the King Who was worthy of all allegiance is rejected by the people privileged to have Him in their midst. The irony–even a despised soldier of the occupying army could see that He was the Son of God. How powerful this presentation must be to the heart of a Jewish person that is Matthew’s target audience. In that a book of the Bible is for both the generation when written as well as later generations, this theme of Matthew makes a powerful appeal to those who read it today. In a passage unique to Matthew, Peter’s confession of Christ is given (16:16). Peter was a man of many, often misplaced, words, but here is his shining moment. He proclaims, “Thou art the Christ, the Son of the living God.” Jesus is the Christ, the great Messiah-King. Matthew’s Gospel presents Peter’s statement as a positive statement of obvious truth. In 16:17, 18 Jesus Himself agrees with and commends Peter’s statement. As the Jewish reader considers what he reads in Matthew, he cannot fail to see that Jesus claimed to be the Son of God. In addition, Peter, one close to Him, claims the same thing. Peter is a Jew, raised with full knowledge of Jewish teaching and custom, and an intimate association with Jesus makes him willingly state that Jesus is the Son of God. Again, that ought to be fodder for thought to a Jewish person in Matthew’s target audience. Would you not agree that after 2000 years it has lost none of its punch? We Gentiles, not part of that original audience, are at no loss whatsoever. 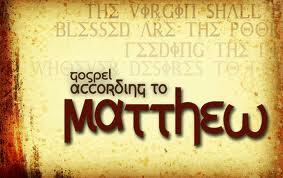 Matthew’s Gospel remains the profound book that moves us to see that Jesus our Savior is the Son of God. Such are the timeless writings of the Almighty God. The theme of Jesus the Messiah being the Son of God is shown throughout Matthew beyond the usages of the title “Son of God” itself. Chapter 1 begins showing that Jesus is of the kingly line of Israel but moves right into showing that He is the Son of God. Matthew 1:1-17 gives us Jesus’ pedigree, which proves a legal right to Israel’s throne. This genealogy is beyond dispute, as the Sanhedrin would have exposed any evidence to the contrary. There was none. The best they could do was to deny the Virgin Birth and call Him the “carpenter’s son”. Joseph, a man who grew up in the Jewish mindset, became convinced He was the Son of God. For the record, though the kingly line has long since been cut off, Joseph is the one man in that line and he believes. In fact, the Sanhedrin never once denied His kingly heritage, but always denied that He was the Son of God. Matthew’s Gospel carefully shows this to its readers. Israel desperately wants a Messiah, but Jesus the Messiah is the Son of God and has ideas contrary to all of Israel’s plans. There is where the conflict arose and that is what Matthew is giving the Jewish reader to contemplate. We cannot even get out of chapter one before all this becomes fully apparent. Matthew 1:21 says His name is JESUS, which is Savior. Israel would gladly accept a king to save her from her political troubles. Matthew’s Gospel, though, tells us “he shall save his people from their sins.” That is another matter altogether and explains a great deal of the rejection Jesus Christ faced. Matthew 1: 22-23 goes on to tell of His Virgin Birth. Matthew’s Gospel of the four Gospels gets the task of highlighting the Virgin Birth. Can you guess why? Surely, it is to help the Jewish reader see that Jesus the King, Israel’s great Messiah, is more than a great king. It is not that He is more dynamic as a king, or that He is innately greater because He is Jewish, or even that He is more favored by God than any other king that has ever lived; no, it is because He is the Son of God. Another strand of thought that brings our theme together is that Jesus fulfills all the Old Testament prophecies of the Messiah. Matthew 1:23-24 offers Jesus as the fulfillment of Isaiah 7:14. It relates what Jewish readers of the Old Testament apparently missed. Jesus Christ, the King, is Emmanuel, or “God with us.” God is with us in the person of God the Son. The Jewish reader has that groundwork laid early in Matthew’s Gospel in order to think about it as the remainder of the Gospel is read. It is the essential theme for the Jewish reader or for us, in that; it takes that essential truth–Jesus is the Son of God– to gain from the life of Jesus Christ. That it is a continuation of God’s revelation begun in the Old Testament only adds to it. Matthew does not give all the human-interest side of Jesus’ birth as does Luke, but only Matthew’s Gospel gives us what is found in chapter two. Many of the strands of thought that combine to give us Matthew’s theme comes out here. An obvious allusion to Daniel 9:27 for timing and Micah 5:2 for place shows Old Testament fulfillment. Miracles involving the star and supernatural warnings show the uniqueness of Jesus and are a prelude to His mightiness that will be shown throughout Matthew’s Gospel. He is the King of the Jews as even the Wise Men can see. The irony of His rejection comes into clear focus as the religious leaders of Israel who through the Scriptures know the time and place of the Messiah’s birth ignore Him. There is no celebration at His birth and no one even makes the effort to go the six or so miles from Jerusalem to Bethlehem. That would surely smite the Jewish reader’s heart. The reader is left to wonder if the Jews who claimed to want a Messiah, and who did want political help with Rome as well as more freedom and power, knew more than they let on. Did they see that He is the Son of God with a spiritual agenda? Is that why they have no use for Him? The wonder of the Holy Spirit’s design in Matthew’s Gospel is that this all works together as a powerful polemic to accept Jesus Christ as the Son of God. No doubt, Jesus’ earthly ministry was far removed from what many Jews expected. It is not what you would think an earthly king would do. For example, Jesus inaugurates His ministry with a baptism. Where is the coronation? We should see, however, that no matter what expectations were, Jesus is the Son of God. The dramatic scene at the Jordan River shows us. The Father Himself states: “This is my beloved Son, in whom I am well pleased.” Israel is not pleased, but the Father is. Ouch. How this must pierce the heart of the Jewish reader. In that there is rejection in all of our hearts, this should move us as well. It is as if the Father reserved for Himself the first mention of Jesus being the Son in Matthew, the first of the New Testament in fact. Chapter 4 moves on into Christ’s temptation. Besides the practical teaching on facing temptation, the reader can see that this Jesus Christ is not a mere man. Not even the greatest man, nor the strongest king, could triumph as Jesus did here. He is the Son of God. The Sermon on the Mount in chapters five through seven given us early in this Gospel shows us His perfect teaching. Matthew’s Gospel records the fullest account of that famous sermon. You hear the ring of the Old Testament in it, yet it is so much more. So spiritual, so discerning, so unselfish, and so unlike the heart of man is His sermon. He is the Son of God. Matthew’s Gospel presents its material in a uniquely organized way. While the other three Gospels are for the most part chronological, Matthew has one whole section that is not. Outside of this section Matthew is mostly chronological, but in this one section the material is given in topical form. In relation to the theme, Matthew’s Gospel puts some of the greatest miracles early. This might especially help the Jewish reader to see that Jesus is the Son of God. In Matthew’s design the earlier this truth can be ascertained the better. You and I now with four Gospel records to read are blessed to have one of them with this approach. After the aforementioned special topical section in Matthew’s Gospel, there are other places where the theme shines through. Besides the episodes where the title “Son of God’ is mentioned, there are passages like the Transfiguration in Matthew 17:1-13. Yes, two other Gospels tell the same story, but reading Matthew straight through you see it falls in line with the theme. That Jesus stands above Moses, the great Lawgiver, and Elijah, Israel’s famous larger-than-life prophet, speaks volumes. A great king would not have credentials to overthrow them, but the Son of God does. That no misunderstandings develop, the Father speaks again: “This is my beloved Son, in whom I am well pleased, hear ye him.” Notice too in the story of the Transfiguration that Matthew puts great emphasis on Jesus’ brilliant radiance so that we would not miss that we read about the Son of God. Then there is the account in Matthew 18:20 where Jesus says, “For where two or three are gathered together in my name, there am I in the midst of them.” While a king could not do that, the Son of God could. Jesus also told parables with Himself in them. For example, in the Parable of the Wicked Husbandman Jesus is the unique son. Even the casual reader can see that “the son” is none other than Jesus Christ the Son of God. In the aforementioned trial of Christ where the High Priest sarcastically mentions the title “Son of God,” that same episode gives another irony that the reader of Matthew’s Gospel should not fail to see. Jesus is condemned on the very charge of claiming to be the Son of God. By this point the reader of Matthew already knows He is the Son of God and it is Jesus’ accusers who are the blasphemers. Another thing we see throughout Matthew’s Gospel is that Jesus forgives sin. What would be evident to all readers is that only God could do that. Matthew’s Gospel, then, has presented its theme in various ways since chapter one so the foundation is laid before we are told of the greatest event of human history¾the Death, Burial, and Bodily Resurrection of Jesus Christ. Jesus on the cross is the act of paying for sin so that it can be forgiven. No king could do that deed; no, only the Son of God could. Think of His Resurrection. We are so beyond the pale of men, so beyond a great king, and so beyond what even the most optimistic Jewish person could hope for in a Messiah. He conquers death! He is the Son of God. Even how Matthew’s Gospel ends highlights our theme. Each of the four Gospels ends highlighting a different event. Matthew’s Gospel ends with the Great Commission that is the King’s orders until He returns. Still, Matthew 28:18 is the pinnacle of what Matthew has been saying to his Jewish readers and to us. There Jesus says, “All power is given unto me in heaven and in earth.” Look at the scope of His power. Look at the borders of His Kingdom. He is not a mere king, or even the greatest king. Israel is just a portion of His vast Kingdom. Israel’s Messiah is just a snapshot of His Eternal Person. The Jewish perception cannot contain Him. No, it is clear, as Matthew’s Gospel labors to show, that Jesus Christ the King of Israel is the Son of God. Matthew 4:3, 4:6, and 8:29. Matthew 26:63, 27:40, and 27:43. The point of this discussion is not to highlight Israel’s guilt regarding Jesus Christ as much as to show a loving appeal given on their behalf. The section is Matthew 4:12-14:13. It corresponds to the “Early Great Galilee Ministry” as shown on the chart “Overview Harmony of the Gospels”. These particular parables are often called Kingdom Parables. Matthew 26:57-68, particularly verse 65. Email me if you want a pdf of any chart referenced. No Matter The Cost–A Needed Book! Men, are you discouraged or broken? Have you even made foolish decisions? Do you need the courage and hope to go on? 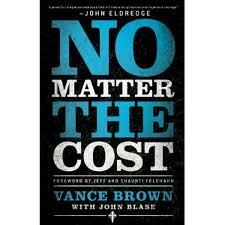 Then this book by Vance Brown with John Blasé and published by Bethany House is the book you have been waiting on. We have here the call for “imperfect, broken, foolish men” to step up in the battle and fight “no matter the cost.” Do not suppose, however, that this book is just a pep talk, or an inspirational challenge. This is a realistic view of us coupled with a realistic view of Christ. Because of a mix up at my home, I didn’t realize I had this book to review till I just discovered it recently. By that twist of fate I had an entire night in a waiting room to devour this book carefully. It moved me. He weaves the story of George Bailey from “It’s A Wonderful Life” and shows that is the story of far more of us than we’d care to admit. He says this defines many of us men: “all alone, exhausted, weary, bone-tired, questioning our worth, feeling much more dead than alive, courage struggling for oxygen.” We have our dreams, or at least we had them. Years and events mingled with some stupidity and we lose hope. Amazingly, he also uses the Lord’s Prayer to teach us. While it might not be the most exegetically precise thing you have ever read, it really works. It takes you somewhere. Somewhere you need to go. You will notice that he focuses on our relationship with the Lord on the one hand and our Christian brothers on the other. It makes sense! He writes well. The illustrations are exceptional. The transparency is amazing. 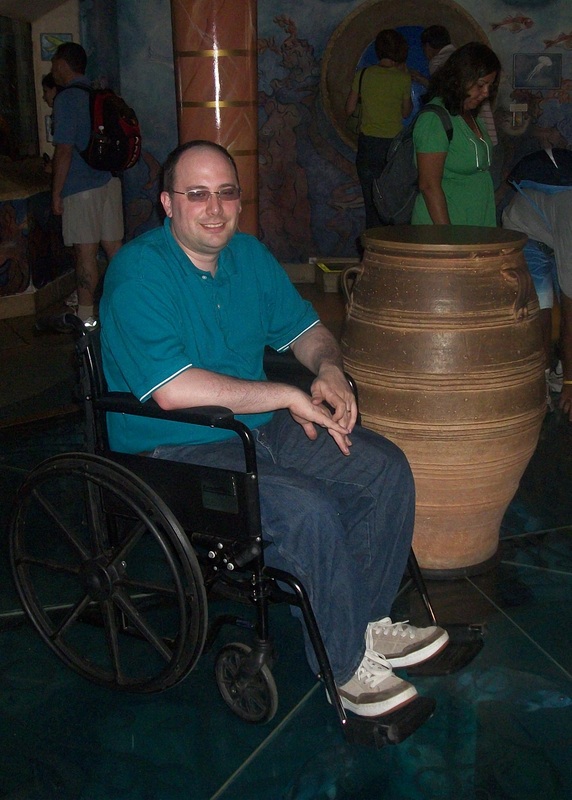 He shares real failure and proves that the Lord was not done with him. What could encourage us more? You may be aware that Mr. Brown heads Band of Brothers. Don’t be concerned that this book is just a selling job for that organization. While the principles of this book underlie that organization, that is rarely the focus of the book. No, he writes at your heart and life. At least he spoke to mine and I highly recommend this book. We have here a followup to the widely read volume “Radical” by David Platt. 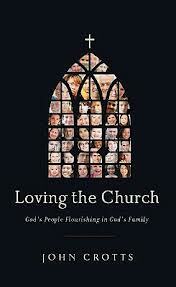 That book, I have learned, is changing the way some look at church. This book, apparently, expands on the earlier book. I have not read yet that earlier book, but some criticize this volume as being just a condensation of the earlier book and not worth the extra expense. I’ll leave that choice with you as I just consider this volume. The core of the “Radical” question in the first half of the book is: Is Jesus worth it? That would seem to be a no-brainer as Mr. Platt readily admits, but he works to examine if we really feel that way. In the process he shows that we often act opposite to Jesus Himself. For example, we are consumed with crowds while Jesus was often turning them away. His concerns and goals were different from ours. He finds fault with our massive building projects while we spend miniscule amounts on needs around the world. Some might feel he blurs the line between social projects and the Gospel. He is challenging but I feel that way myself as I read him. I can, however, certainly agree with his appeal that Christ is worthy of our lives. The second half of the book is the idea for taking “Radical” forward. He criticizes our reducing church to a staff of paid professionals providing spectators a worship experience. I was about to think he wanted to put all of us full-time pastors out to pasture, but he finally confessed that was not his point as he himself was a full-time pastor! In truth he has a great point. We need to all be involved, not just a few of us. It would make such a difference in our churches were we to turn this around. So this is an easy, quick read that will spur thought in our busy lives. You might want to give it a look.